Exquisite watercolour illustrations breathe warmth and life into the story of the birth of Jesus in this new paperback original Christmas Story. 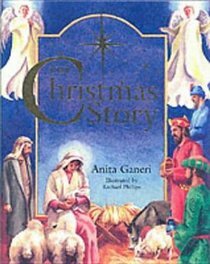 Anita Ganeri retells the traditional biblical story with her usual sensitivity and gift for drawing children into the narrative. Words and music to the favourite Christmas carol 'Away in a Manger' as well as some special Christmas recipes that children will enjoy trying out are included. Gold blocking on the cover adds a Christmassy feel! An ideal Christmas gift for any child!